Achieve those flowing, tousled waves with Joico’s Beach Shake Texturising Finisher ideal for medium to thick hair. Unlike traditional beach sprays that contain harmful drying salts, the tactile and fast-setting spray is enriched with a combination of natural ingredients. 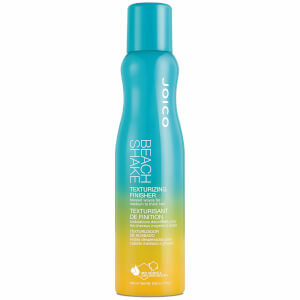 Beeswax and flexible resins carve out that beachy, windswept look and creates separation, while rich coconut and sunflower seed oils ensure moisture retention and gives your hair a nutrient-packed, satin finish. Shake well and apply on dry hair, lightly lifting layers whilst continuously spraying and letting the hair fall through mist to carve out satiny separation that mimics a “modern beach look”, all without the salt of traditional beach sprays.